At most Japanese restaurants, any entrée or selection of sushi comes with a complimentary cup of miso soup. It's usually delicate in taste and garnished with bits of scallion, cubes of silken tofu and floaty bits of seaweed. The dish is made with a broth called dashi. The classic version is flavored with bonito flakes and kombu seaweed, both of which impart salty and savory qualities. (Vegetarian dashi omits the flakes, which are made of fish.) To that, a dollop of miso paste is added, and the soup, now with floating clouds of sediment, is finished with garnishes and delivered to diners. Miso is much more than a Japanese variation on the bouillon cube. The paste, which is made by fermenting grains or legumes with salt and koji — another name for the fungus Aspergillus oryzae — can be mixed into condiments, thinned into a marinade or used as a pickling agent for vegetables. Miso's health benefits are the stuff of legend. After the atomic bomb was dropped on Nagasaki, Japan, on August 9, 1945, Dr. Tatsuichiro Akizuki noticed that none of his tuberculosis patients developed acute radiation poisoning, despite having been a mere 1.4 kilometers from the bomb's epicenter. He attributed this marvel to their daily consumption of miso soup. Thus, after the nuclear power plant meltdown at Chernobyl, Ukraine, in 1986, residents in the vicinity were encouraged to consume miso soup as an antidote to radiation exposure. And a 2013 study by Hiromitsu Watanabe, published in the Journal of Toxicologic Pathology, shows that miso also protects against strokes and various kinds of tumors. Plenty of less-dramatic claims can be made about the benefits of miso, too. Like many fermented foods, it's thought to contribute positively to the gut microbiome. It's an excellent source of protein — versions made from soybeans provide all of the essential amino acids that humans need but must get from dietary sources. 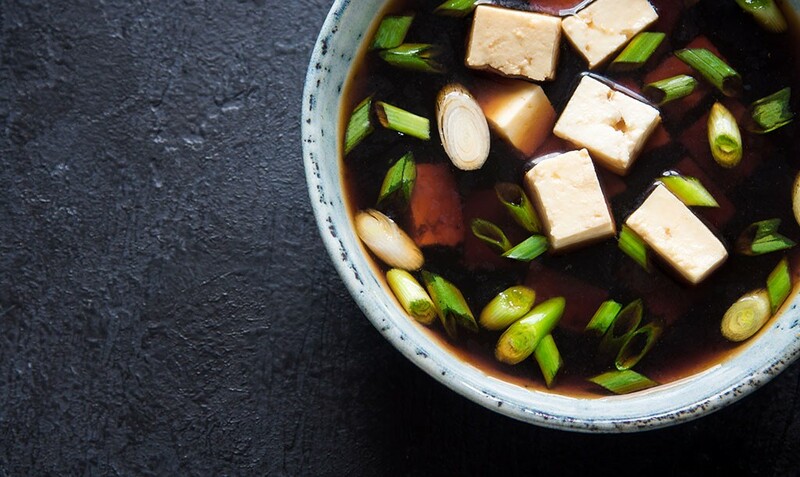 Miso is also a rich source of other nutrients, including phosphorus, manganese, calcium and vitamin K, as well as fiber. Vermont has just one commercial miso producer: Rhapsody Natural Foods in Cabot. There, Sjon and Elysha Welters, with help from their children and grandchildren, produce tempeh, amazake, natto, egg rolls, rice bran, koji and two kinds of miso (see glossary below). In 1997, the Welterses, who came from the Netherlands, opened a vegetarian restaurant in Montpelier next to the Savoy Theater. In 2011, they sold the spot to the owners of Bagitos Bagel and Burrito Café and began to focus on commercial production. Their miso came along in 2012. "We wanted to make our amazake organic, but we couldn't get organic koji, so we decided to make our own. The moment you start making koji, you might as well make miso, too," Sjon Welters explained. Plus, because miso is a living food, it "takes on the characteristics of the environment," he said. "Every region in the country should have its own artisan miso maker." Traditionally, miso is produced in winter when fewer yeasts and bacteria are floating around. Sans too much competition from other microbes, the koji fungus, with which the paste is inoculated, can take hold and multiply. Come summer, the ferment is strong, and problematic organisms — which are more plentiful in the season's warmth and humidity — are less likely to gain traction. By fall, the miso is ready, but it can be aged even longer for more intense flavor. Rhapsody offers both white and red miso, and the Welterses cook with it every single day. "You can put it in bread instead of salt," Sjon Welters said. "You can take miso and put cut-up onions, cucumbers or carrots into it and make the best probiotic pickles you can think of." The family also uses miso in salad dressings, as a sauce for tofu and as a marinade for zucchini before grilling. And, of course, they stir it into soup. "When you make soup," Welters said, "you usually put salt into it, but if you use miso instead, it makes it so much richer. You get the probiotics, the medicinal qualities, and, suddenly, your soup becomes a multidimensional dish." Welters believes that all Americans would benefit from including more miso in their diets. "Food nowadays is too devitalized and too industrialized, but miso is an ancient food, still made the same way it was made a thousand years ago," he said. "It's an antidote to a polluted world." Many kinds of miso exist, made from different grains and legumes and aged for varying lengths of time. Here are some of them, along with related products. Amazake: A rice drink made with koji, the same fungus that is used to make miso. In Japan, it's considered a cure for hangovers. Barley (mugi) miso: It has a grainy aroma but a milder flavor than bean-based misos. It can be smooth or chunky. Brown rice (genmai) miso: A bit sweeter than most misos, the rice variation needs less time to age because its starches break down quickly. Koji: Aspergillus oryzae, the fungus used to make miso, amazake, sake and an alcoholic beverage called shochu. Natto: Soybeans fermented with Bacillus subtilis. Pungent and slimy, it has many health benefits. In Japan, it's generally mixed with mustard and soy sauce and eaten for breakfast. Red (aka) miso: Salty and strong, it is excellent in dishes with meat or mushrooms and as an ingredient in marinades. Soybean (hatcho) miso: Named for the Chinese city in which it originated, it is typically aged for two to three years. White (shiro) miso: This mild miso isn't fermented as long as other variations. With a less-funky flavor, it can be added to a wide variety of recipes without overwhelming the other ingredients. Tempeh: A cake of fermented soybeans, originating in Indonesia. It's often used as a meat substitute in recipes. Yellow (shinshu) miso: The oolong of miso, fermented for longer than white miso but not as long as red. Its flavor falls between the two. I love restaurant miso soup, but at home I like to make my miso a meal by mixing in vegetables, mushrooms and other ingredients. Make broth: Cut flavoring agents into small pieces and simmer in liquid, with condiments, for 15 minutes. Meantime, cut soup ingredients into bite-size pieces. Strain soup base, discarding solid bits, and return liquid to heat. Add soup ingredients: When broth has come to a simmer, add ingredients that will take the longest to cook, and then gradually add the others. For instance, cabbage or sweet potato will need to cook a few minutes, while tofu merely needs to be heated through. When these are done, turn off heat, remove pan from burner and let sit while you complete the assembly. Assemble: Place precooked starches in serving bowls. Ladle a cup of broth from the pot into a separate bowl and stir in miso paste to make a slurry. Stir slurry back into the broth. Taste. Add more miso, vinegar or mirin as needed. Then ladle it into bowls over the starches and garnish with sesame oil and sliced scallion. This is about as close as you can get to a Vermonty version of seaweed. Preheat oven to 350 degrees. Blend the miso and sesame oil, stirring until combined. Pull the kale into bite-size pieces and place in a mixing bowl. Using your fingers, massage the miso mixture onto all surfaces of the kale. Bake for 10 minutes, stir, and return to the oven until the pieces are crisp but not browned, between 5 and 10 minutes. Best eaten immediately, as the snappy texture doesn't last. If you don't want to make the mayonnaise from scratch, simply stir miso paste, a little sesame oil and some scallion into the store-bought stuff. You may want to watch a tutorial on the web before you begin. Making mayo isn't particularly tricky, but it is possible to "break" the mayo by adding the oil too quickly or by adding too much. Separate the eggs, placing the egg yolks in a large mixing bowl. Add mustard and lemon juice, and whisk until the yolks have lightened to a lemon yellow. Very slowly, a trickle at a time, whisk in the sesame oil. (It's great to have a helper to pour in the oil for you. If you don't, fold a kitchen towel into a ring that the bowl can sit on. You want the bowl to stay still as you pour oil with one hand and whisk with the other). When the sesame oil has been incorporated, begin with the neutral oil, whisking constantly. Eventually, the stuff will start to look like mayonnaise. When it does, stop adding oil. Stir in the miso, scallions and black pepper. Taste. If you want it to be saltier, add more miso or a sprinkle of sea salt. For more tang, add more lemon juice or mustard. This mayo is great in slaw, smeared on veggie fritters or in sandwiches. The original print version of this article was headlined "Miraculous Miso"